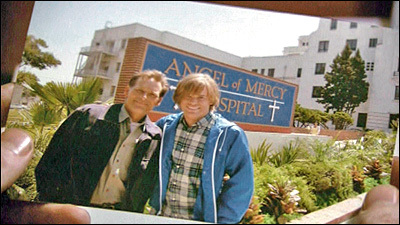 The location: 'Angel of Mercy' Hospital. A. The former 'Angel of Mercy' Hospital. A. It's not specified, but most likely somewhere in or near Miami, Florida. A. In Episode 4 (of Season 1), "Let's Give the Boy a Hand". We first see the hospital in a flashback, when young Dexter's foster father proudly shows him the hospital (which is about to close for good), and tells him about how his grandfather worked there for 30 years - starting as as a janitor - to feed his family. 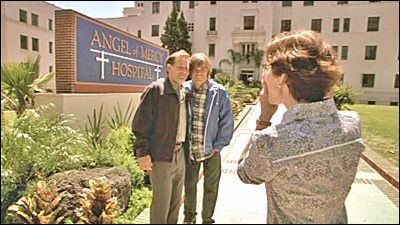 The adolescent Dexter is reluctant to have his photo taken with his father outside the hospital, but after his father shows sudden signs of being ill, Dexter changes his mind and willingly poses for the photo. In the present day, the "Ice Truck Killer" keeps one of his victims alive in the empty hospital, so he can amputate parts of the victim, one at a time, and leave them in various places for the police to find. 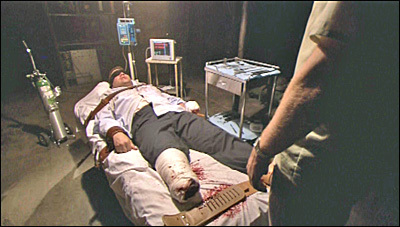 Later, he lures Dexter to the hospital and leaves the victim there for Dexter to find, assuming that Dexter won't be able to resist killing him. Finally, we see the hospital again in the next Episode 5 ("Love American Style") when the police descend on the crime scene, looking for clues to the killer's identity. A. This is the old Linda Vista Hospital, located at 610 S. St. Louis Street, in the Boyle Heights section of East Los Angeles. That's just east of downtown L.A., south of 6th Street, and next to Hollenbeck Park. Empty since 1990, the 1937 hospital has been used as the filming location for many a movie and TV show, including "Pearl Harbor", Arnold Schwarzenneger's "End of Days" and Jennifer Lopez's "The Cell". Here is an aerial photo of the hospital. And here is a map link. A. 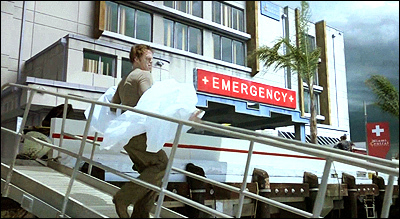 My first thought was that it might be one of the Long Beach hospitals (given the amount of time that the "Dexter" crew has spent in that city). But once I had eliminated that possibility, I immediately thought of Linda Vista, since I have written about it (as a location) several times on my Seeing-Stars site. So, I took a look at it via Live Local's aerial photos and compared it to the "Dexter" screencaps. A perfect match, of course.